I think the provided documentation maybe a bit - - - too verbose and not fully simplified. Some of the provided documentation is for those that want to create modules for Bootless Star or to modify the core, so not all of the documentation is created for general use in mind. What I am going to do is provide the steps in order to install and setup the program and the GZDoom Builder module (as it is actively developed at the time of this post). Whatever you learned from the overly complexed documentation that contains foreign jipperish, forget it about it for now. CAUTION: The legacy is only available for those that need it specifically as the foundation and support with Ruby is completely different as opposed to the early beta builds. With that said, the Legacy version is outdated - unsupported and shouldn't be used for generalized use. Do NOT create a folder in the Program Files or Program Files (x86)! Bootless Star is NOT designed to work in that environment! As of Windows Vista, programs can NOT write or control within that environment without needing Administrative permissions. RECOMMENDED: Use 7Zip to extract the Bootless Star zip file to the newly created folder that was just created (the step above). Required Step for Windows 8 and later with Windows ZIP (via Windows Explorer Shell): After extracting the contents from the .zip file, you _MUST_ unblock the 'BootlessStar.bat' file. Doing this, Windows will allow the program to execute and run normally, failure to do this step - Windows will NOT allow the program to execute at all. Execute the BootlessStar.bat program and make sure it goes to the 'Main Menu' screen. Working Directory and Program Directory mismatch (or Hooking failure); when this error comes up, the program can not update the user's WD to match with the program's active directory. Please submit reports when this happens. Operating System Compatibility issue; the program detected that the host system is not using Windows 2000 or later (NOTE: Windows XP is the minimum requirement; running the program under Windows 2000 is not possible and will crash prematurely). This program is not compatible nor supported with WINE for those under Linux flavor. Keeping this short; most of the settings can be ignored unless the user wishes to be adventurous or power user. Go to the Settings (type: s key) menu from the Main Menu. Look over what programs have not been detected by Bootless Star automatically. Bootless Star will state what was detected and what was not detected. For example: "Detected: [ False ]"
True, Bootless Star was able to find this program or directory. False, Bootless Star was not able to find this program or directory. When entering a new location path, use _exact_locations_ (or Absolute Paths). Meaning, do NOT use: ".\MyLocation\someProgram.exe", instead use: "C:\Some\Path\Here\MyLocation\someProgram.exe". In addition, do _NOT_ in any circumstance use quotes. Bootless Star uses quotes in a entirely different purpose, when quotes are entered by the user the program will crash. If the path contains spaces and fancy characters, the program will automatically deal with those scenarios. 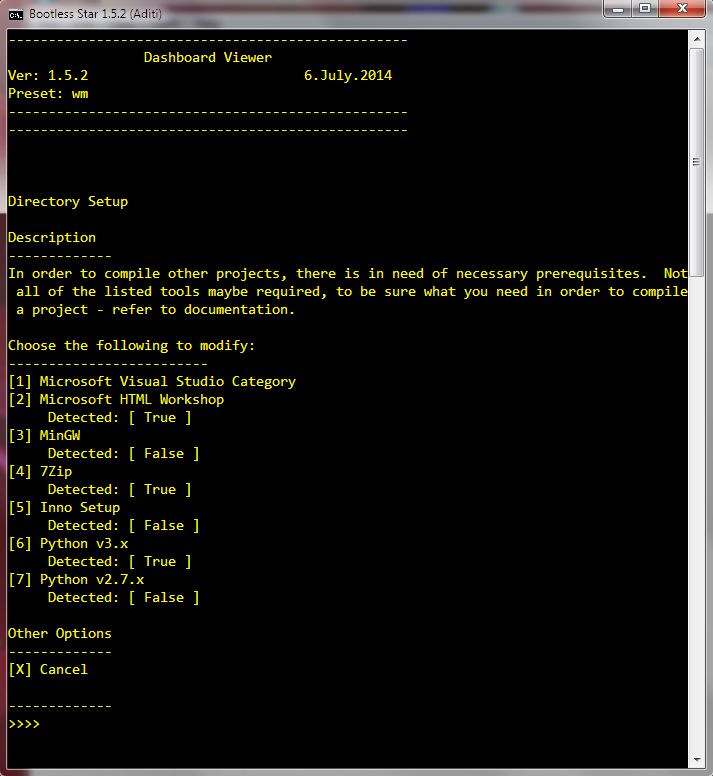 Most projects will require Microsoft Visual Studio; from the Directory Setup Menu, go to " Microsoft Visual Studio Category"
This will display what was detected and what was not detected. You shouldn't need to program this unless the user manually edited the system's global variable environment. If incase you need to edit these, please pay close attention to the instructions as the locations are bit different. Save a new preset configuration file, by using 'Save Settings' (type: 2 key) and enter a new filename that you wish to use. It is nearly essentially to create a new a configuration file as modules will not allow the user to save their configurations without having one already from the Bootless Star program. To install a new module, type: i. A new window will appear on the desktop and Bootless Star will provide onscreen instructions. To install a module, simply put the '.bat' file of the module (for example: GZDoomBuilder.bat) in this window. Close the window that should now contain the .bat you dropped into the folder. Press any key on the Bootless Star program to return to the Module screen. Make sure that the module you have just installed is visible on the list of available modules. Versions higher than 2010 are fine. 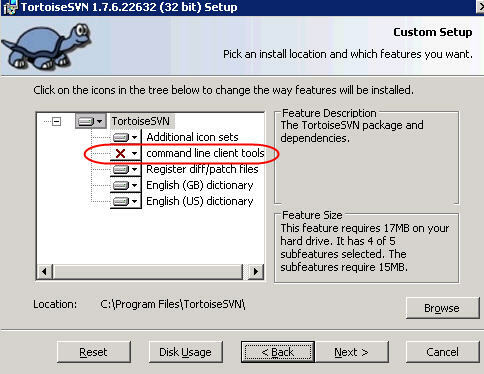 It is required that the TortoiseSVN Commandline tools are installed! If the module is not visible on the list, it must be first installed. Refer to Bootless Star 'Installing Modules', a few sections above from here. 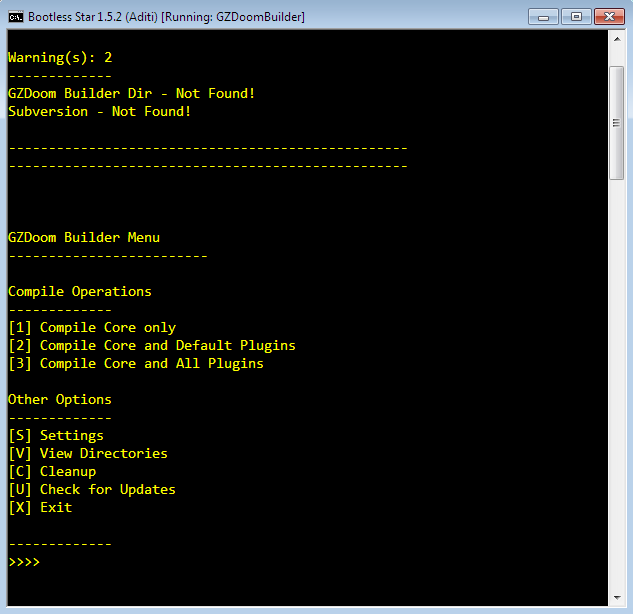 Go to any folder you wish to put the 'Doom Builder' local working copy. This can be on your desktop, your home folder, wherever you wish. NOTE: This is NOT the actual compiled program, but instead this contains the source code that makes this software possible to work. Keeping this short to only important topics, but do look around the settings and explorer what is available. There is features that allows the Doombuilder Local Working Copy to be automatically updated before it is compiled and more, feel free to explore. 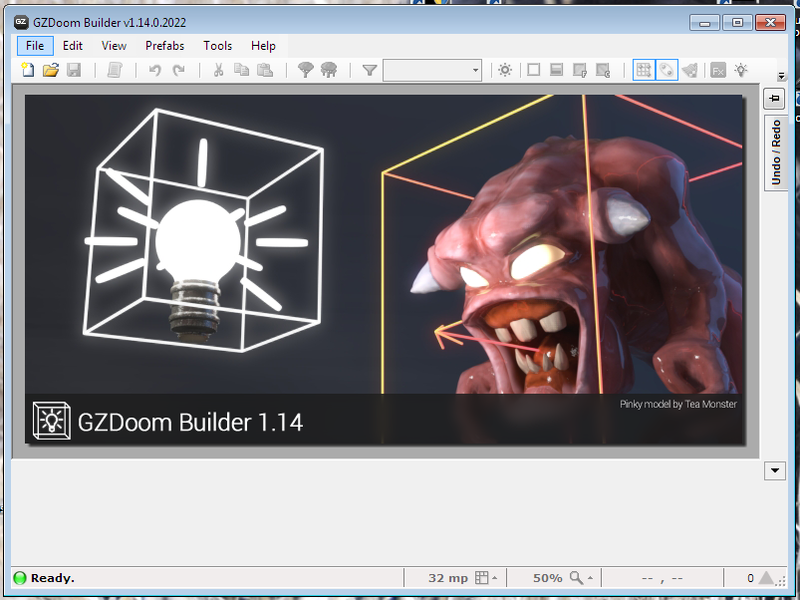 Enter the path that contains GZDoom Builder's solution file within the Doom Builder project local working copy. Within the working copy we just checked out from the step above, we need to tell this program where to find it. This will update your configuration with the latest changes. When this module is restarted, the configuration is automatically loaded during startup. Generates the GZDoom Builder core program, help documentation, and default plugins. 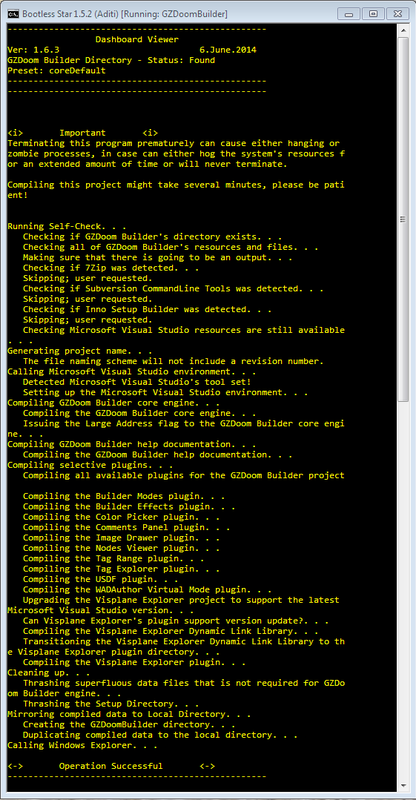 Generates the GZDoom Builder core program, help documentation, and all plugins (even unsupported ones). When failures occur, read the messages on the screen and investigate the issue. If compile errors occur, enable logging from the Bootless Star core (within the settings) and recompile the project while logging. The output messages could be useful for the developers for pin-pointing where the error occurred. Last edited by Tiger on Thu Sep 04, 2014 5:24, edited 12 times in total. how do I get into the GZDoom Builder project Main Menu ? Last edited by Tiger on Thu Sep 04, 2014 12:57, edited 1 time in total. Reason: Yikks! I accidently edited your post by accident! I tried to restore it back to its original state, sorry! Tiger wrote: Execute the GZDoomBuilder.bat moduleIn Bootless Star's Main Menu, go to: 'Run Project Modules' (type: 1 key)From the 'Run Project Module' screen, type GZDoomBuilderIf the module is not visible on the list, it must be first installed. Refer to Bootless Star 'Installing Modules', a few sections above from here. Just enter the filename in the 'Run Project Module', this really just 'calls' the module you just put in that directory. If you already checked out the project (with the same folder name), you merely only updated your Local Working Copy -- everything is up to date and ready for use. Any luck so far? If you still need help, we can try to meet on IRC, - probably meet up in #ZDoom (irc.esper.net). After a lot of head scratching, I believe that I finally achieved the correct setup. Although I am still not comfortable with it. However, when running the generated build, I do not get the correct version number. I had saved the settings as wm.bat but the coreDefault.bat comes up every time. At least it worked once. NeoHippo wrote: However, when running the generated build, I do not get the correct version number. This is because you told the program to not fetch the latest revision ID. To change this setting, within the GZDoom Builder (.bat file) settings - go to 'SVN Settings' and then enable the 'SVN Master Control'. Enabling this (the rest can be false if you wish) alone allows the program to use the 'svnversion' command, which fetches the latest svn version from the project's repo. But, again, make sure that the TortoiseSVN Commandline tools are also installed (they are not by default); the program couldn't detect the SVN Commandline tools as that warning is telling me. NeoHippo wrote: I had saved the settings as wm.bat but the coreDefault.bat comes up every time. Every time you startup the program, you must go through this process of loading your configuration file. Once your configuration file is loaded, be sure that within the GZDoom Builder module, you also 'update' the preset to include the desired settings you want to save within the module. TortoiseSVN to version 1.8.8 and made sure that those tools were enabled. Then I gave it another try to install ADITI and got stuck again[/url]. I feel that I am getting closer, though. Last edited by NeoHippo on Tue Sep 09, 2014 7:55, edited 1 time in total. This behavior is expected. The program will open a new window on the desktop, - which from there the user can do a simple-drag-and-drop as explained in the instructions. The notice I find to be rather necessary as, believe it or not, Bootless Star's controlled environment is as safe as Windows 2.0 (stable than Windows 1 - excluding driver hell -, but still easy as hell to screw up as the environment is not 'knit-tight'), I don't think it is possible to make the environment any safer given the Batch shell environment. However, as long as the module is 'safe to use', then everything should be fine. And when worse comes to worse, (or those that are developing modules for this software) they can resort to using sub-processes which will avoid the Windows Batch Shell from killing itself from the most extreme complications. Fun Fact: Did you know that it is possible that the Batch Shell can loose it's fork processes - including the root process, and that running this software in PowerShell can have intermittent and unexplained issues? Fun! And now I am stuck. GZDoom Builder Dir - Not Found!. Whatever I do, I can't get rid of that message. What directory did you checkout the Doombuilder project onto your system? are being or should be created during the setup procedure. Can you elaborate a bit on this, I don't fully understand? After a lot of typing, and trial and error processing, I believe that I finally got it to work. Thank you for your patience and for creating ADITI. I am sure if the software wasn't CUI oriented, you would feel a bit more comfortable with it -- The CUI is a bit intimidating even with the most simple brain-dead applications. Feel free to explore around within the settings and - ask me for clarification when you need something further explained. Furthermore, if you would like to help out the DRDTeam by providing uploaded Developmental Builds of: GZDoom Builder, Doom Builder 2, and Doom Builder 64, please contact Eruanna or Enjay. Tiger wrote: Furthermore, if you would like to help out the DRDTeam by providing uploaded Developmental Builds of: GZDoom Builder, Doom Builder 2, and Doom Builder 64, please contact Eruanna or Enjay. I was thinking of "applying" for this since I have a lot of free time on my hands, but I haven't got into the whole compiling source code for these editors, yet. I'll probably give it a try soon. Tiger wrote: ... ask me for clarification when you need something further explained. While everything else seems to fall into place quite nicely, there is one thing that still eludes me. At the moment, the help manual displays just question marks when accessed from within GZDB. I could use an extermal CHMtoHTML converter, but that sort of defeats the purpose.